It’s an exciting event that’s coming up. I haven’t spilled the beans just yet, only a couple more days. I’m thrilled about it. Keep watching this space. Wikipedia’s entry for August Sander. This month JapanesePhotos.Asia celebrates the 175th anniversary of photography. For discounts on certain photo purchases see the announcement on the 1st August, and join in with the fun. Update on 10th March 2015: I just discovered David’s website, http://davidduchemin.com/. It’s exciting. I’m buzzing with excitement, but I’m not spilling the beans on what it is just yet. Not too long now. Wikipedia’s entry for Ansel Adams. I’m looking at going overseas for travel, so I need a camera that is not a magnet for thieves. So, naturally, I have some requirements for a bag the will hold (and keep) stuff. I need it to lock. It’s easier to steal something from inside a bag, as the owner will believe that since the bag is there, everything is there, and so the alarm won’t be raised for a long time. Also, it is easier to conceal a stolen item as it is usually smaller than a bag, but it is harder to steal the whole bag. It needs to look casual so it doesn’t look like it’s got a camera or other expensive things inside. I do need it to carry an SLR (or two), some lenses and essential accessories, so it’ll be (and look) heavy. Also as carry-on luggage it needs to carry my laptop and so I need to be able to take it out and put it back in easily during airport screening. Finally, as carry-on luggage it’s got to carry a guidebook and novel. So in this Japanese store there are hundreds of camera bags, but does any of them meet my requirements? No. Don’t be surprised. There’s only a couple of dozen designs, but they display multiple colours and sizes of essentially the same couple-dozen bags. The most common issue where these bags fail is that zips cannot fit a TSA padlock or there is nothing for the padlock to secure to. Or worse, there are no zips, just clips. Eh, it was so tiring looking around! Did I buy a bag today? No. I’ll have to shop another day. Something special is coming up in one month’s time… stay tuned. A photograph is a secret about a secret. The more it tells you, the less you know. Diane Argus (1923-1971). An exciting event is coming up, but I won’t be telling you what it is. If you can work it out, please bite your tongue, and point others to this little blog. Wikipedia’s entry for Dorothea Lange. There’s usually plenty of reasons to be in a major city like London, Melbourne, or New York during summer. Though, I’ve heard Parisians tend to evacuate their city in summer. Anyway, summer seems to be the time when office workers discover a world outside their buildings, uni students discover life after exams, communities look over their garden walls and discover they’ve got neighbours. As you’ll also soon see, Japan is a land of superlatives. Here’s the top 5 reasons why summer in Japan is great. Nagoya is Japan’s fourth largest city, and is conveniently situated between Tokyo and Osaka. 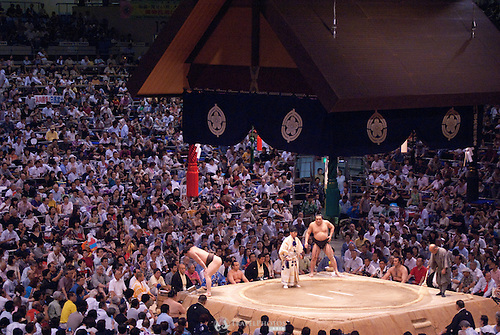 The Nagoya Summer Grand Sumo Tournament is held for the 15 days (from Sunday to Sunday) in the middle of July. For this sumo photo, and others like it, see the Sumo gallery at my PhotoShelter portfolio. This is the hottest sumo tournament. Really, you’ll be sweating a lot in the stadium. You’ll need to pay inflated prices for cool drinks, but fans are free. There’s lots of them. Everywhere, almost every weekend from about the end of July to mid to late August. Look up some travel related websites to find out what’s going on, where, and more precisely when. There’s a variety of festivals including sea / marine, fire, community, dance, and more. The Kuwana Stone-bringing festival is held on the first weekend of August, annually. This is apparently the loudest festival in Japan. See here for the Ishidori / Stone-bringing Festival gallery on my PhotoShelter portfolio. This festival, yes another festival, is supposedly the biggest in Japan with possibly a million people gathering in the festival vicinity at some point during the day or evening. The Tenjin Festival is held on the 24th and 25th of July each year. The men’s part of the Tenjin procession. 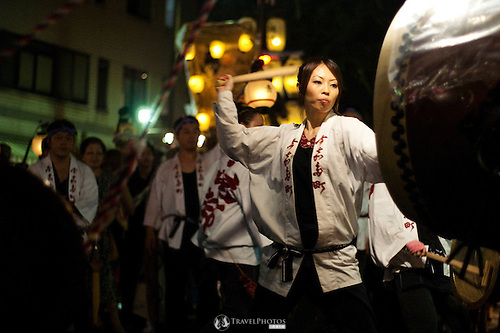 For this photo, and others like it, see my agent’s website, “Tenjin Matsuri“. It’s usually held on the first weekend in August in Central Park, Sakae, in the centre of Nagoya. The World Cosplay Summit (WCS) is trying to become the central or focal point of the cosplay culture. However, the main rule is that all costumes must be of a Japanese origin comic, animation, video game etc. So no Star Wars, no Harry Potter, no foreign stuff. In short, it’s a big soft-touch diplomacy thing to centralise and promote Japan. That said, it’s still great. Unfortunately, the actual competition performances are bilingual up until the main TV sponsor, Aichi TV, starts to air the competition later in the evening, then all the announcements are in Japanese only. The Finnish team parading on the Red Carpet on the day of the World Cosplay Summit competition performances. For this photo, and others like it, see my Cosplay gallery in my PhotoShelter portfolio and my agent’s website, “Japan Cosplay“. One of the Finnish girls admitted to me that she was warned that it would be hot and humid, and not the choose a costume that is inappropriate for the heat. She admitted they thought they made a good decision, but it seems summer in Nagoya is not like summer in Finland. 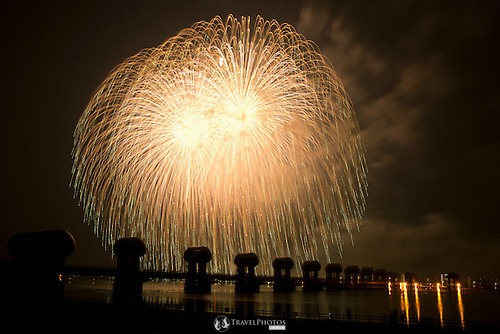 I don’t know why, but Japanese people associate fireworks displays with feeling cooler. Somehow high temperature explosives gives them some relief from the night time heat. Firework displays are held probably every weekend from mid July to late August somewhere in the country. This display in Kuwana city is held on the last Saturday of July. A weekend later Tsu city has it’s display, then a weekend after that is another in Gifu, and it goes on. It’s a time when families bring out the eskies / cooler boxes, with cool drinks, beers, dinner, insect repellent, picnic rug or folding chairs, eat, chat, and wait for the fireworks to begin. For this photo, and others like it, see my Night in Japan gallery on my PhotoShelter portfolio. Note, this photo was taken a some distance, and with my widest angle lens (at 17mm), and it just fits in the frame. New TGIF photos of my favourite models have finally been completed (it’s been a painfully busy time for me). The first batch are already on my PhotoShelter portfolio (Chihiro & Brooke), and more will be soon added to my agent’s website. A Caucasian and Japanese woman in a bar with wine.